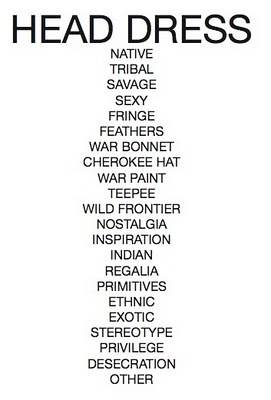 Headdress was created to expose the negative and offensive ways in which Native American imagery is appropriated in "fashion" and "trendy" photographs on popular internet sites. The zine is composed entirely of found images from blogs, juxtaposed with critical quotes from theorists and bloggers examining the effects of cultural appropriation. Akin to blackface. Agreed 100%. Thanks for sharing Head Dress, Jess.